There's this game series called Dragon Quest. You may have heard of it. 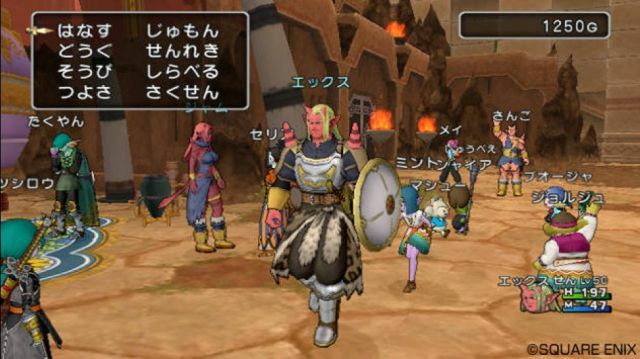 Okay, tongue-in-cheek attitude aside, it's true - the upcoming Dragon Quest X will have online co-op. Players will be able to form parties to go forth and quest for dragons. Yes, it sounds like it'll basically be an MMO. It also has a somewhat ridiculously long subtitle: Dragon Quest X: Mezameshi Itsutsu no Shuzoku Online (which translates to Waking of the Five Tribes Online). What some may be most intrigued by is the fact that the game will be released on both the Wii and Wii U. Not only that, but cross-platform play will also be supported, as will a wide variety of controller support (Wii Remote, Nunchuk, Classic Controller, and USB keyboard). After that, the details get a little more uncertain. The developer is looking into 3DS connectivity, but that's not a promise yet. As it will be an MMO-type game, it's possible the game will also have a monthly fee. The game will be coming out sometime in 2012 on the Wii in Japan, but there's no date yet on the Wii U version or either version outside of Japan. We'll keep our ear to the ground and report back as we learn more.